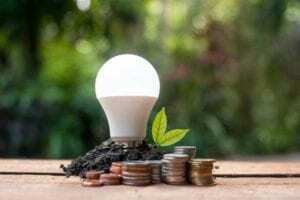 Ways to save money on your utility bills range from a few simple changes around the house to larger tweaks that can drastically improve the energy efficiency of your home. Discover our top tips for energy conservation that might just save you some money too. 1. Replace your bulbs with LED bulbs. According to the Telegraph, the average (medium-sized) household could save up to £240 per annum by switching to LED light bulbs. Although more expensive than traditional bulbs, LEDs could actually pay for themselves (due to the money saved from their energy efficiency) after just 5 months. Fortunately, as they are increasingly the popular choice of lightbulb, LED light bulbs are more affordable than ever. Changing your light bulbs to efficient LEDs is a quick and easy way to reduce electricity consumption as modern LED bulbs are actually up to 75% more efficient than traditional bulbs. 2. Top up the insulation in your loft space. Unless your property is a new build or has been recently renovated, it’s unlikely to have adequate levels of modern insulation, if any at all! By today’s standards, the optimum thickness of your insulation (depending on what type you use) should be around 270mm. It’s well worth a quick attic inspection to check what your current levels are like. If you do have insulation, it could be that your thickness could be doubled or even tripled. Upgrading your insulation levels could save you between £115 and £215 a year as well as reducing your household C02 emissions by up to 950kg too. Been putting off that leaky tap for a while? A dripping tap has the potential to waste up to 4 litres of water a day. If you are on a water metre, it’s like you’ll notice every drop of that as the chances are you’ll be paying for the water that’s being wasted. However, the cost of a plumber to fix the problem could soon be covered by the saving you make on your water bill. Whilst roaring fires in a traditional fireplace are lovely, if you find that your fireplace is more of a rustic decoration than it is a way to heat your home, you’ve essentially got yourself an open channel for all the precious warm air in your house to escape from. Installing a stove can be a really good way to seal off that gap, reducing the loss of hot air up the chimney. Other gaps around the home to watch out for are the seals around doors. Over time, door seals can wear out, meaning gaps can occur that let all that warm air escape. Typically an average bath can use up to four times the amount of water than a shower (fitted with a water-saving shower head). In fact, if you don’t already have a water-saving shower head, it’s worth investigating whether one might be compatible with your shower. Whereas bathing may use up to 100 litres of water, switching to a water-efficient shower head could reduce the consumption of a four minute shower down to just 32 litres of water. Water-saving shower heads can be purchased for around £20 but it’s worth checking with your local water authority first, as some of them even provide the shower heads for free. 6. Turn off your computer. Switching your appliances to sleep mode or powering them down completely rather than leaving them idle in screensaver mode could save you up to £80 a year. This is because, for a desktop computer, screensaver mode can actually use almost the same amount of energy as if your monitor were in use. Many modern computers will allow you to set a time delay for sleep mode. This means that if your computer has been left idle for a set period of time, it will switch to sleep mode and lower its power usage to just a few watts. Of course, switching your appliances off at the socket is the best way to ensure they’re not using up unwanted energy. 7. Pack your freezer with food. Not only can buying frozen food often be cheaper than fresh produce, packing your freezer box tightly can also help you save energy. The majority of the energy that your freezer consumes is used to keep the air within it at the correct temperature. When you open your freezer door, warm air floods in and your freezer must work to cool it back down. Packing your freezer tightly so that there are minimal gaps between produce means that there is less space for the warm air to take up. If packing your freezer full of food doesn’t feel like a money-efficient option, you can try filling large gaps with newspaper, ice packs or even bags of ice cubes.